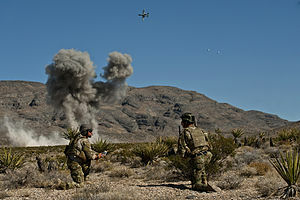 Joint Terminal Attack Controller (JTAC) is the term used in the United States Armed Forces and some other military forces for a qualified service member who directs the action of combat aircraft engaged in close air support and other offensive air operations from a forward position. The term that is used in most other countries, as well as previously in the US and in the relevant NATO standard is Forward Air Controller. The term became effective in the US on September 3, 2003 with the publishing of Joint Publication (JP) 3-09.3 Close Air Support. In 2006, the Royal Australian Air Force became the first foreign air force to receive Joint Terminal Attack Controller (JTAC) accreditation from the United States Joint Forces Command (USJFCOM). No. 4 Squadron RAAF runs JTAC training, and provides trained controllers to other units, with its main role being to support the units of the Special Operations Command. JTAC-qualified personnel have served in Afghanistan. The Australian Army's 16th Air Land Regiment also includes a troop of JTACs. Canadian JTACs are currently part of the artillery observation battery. They are employed in the regular Canadian Army and as part of Canadian Special Operations Forces Command (CANSOFCOM). There is current discussion on creating JTAC as a stand alone MOS/trade within the Canadian Armed Forces (CAF). It is currently executed as a secondary duty by mainly artillery NCMS. Italy has qualified JTAC operators in its tier 1, 2 and 3 teams. Some of these operators have served in Afghanistan, as part of TF45. During the Afghanistan War, AMX ground attack aircraft from the Italian Air Force TF BLACK CATS conducted Close Air Support with JTAC operators on the ground provided by the Italian Army, the Carabinieri, and the Navy and Air Force. The equipment used by Italian JTAC operators is not well publicized, although the equipment used by 185 RRAO has been briefly reported on. The training areas used by Italian JTACs are also kept secret. It has been reported that Italian JTACs will potentially work with the newest gunship, the MC-27J Praetorian in the future. USAF TACP JTACs provide over watch and call in air support at Contingency Operating Post Jaghato, Afghanistan, May 1, 2010. A qualified and current JTAC is recognized across the U.S. Department of Defense as being capable and authorized to perform terminal attack control. Must be winged Naval Aviators or NFO with at least 2 years operational flying experience. Must have attended and graduated from the Expeditionary Warfare Training Group (EWTG) Tactical Air Control Party (TACP) course. At the completion of the TACP course Aviators are granted the 7502 FAC MOS and are considered certified and qualified JTACs. They must be a Noncommissioned Officer or above, and must have a combat arms Military Occupational Specialty with one year of operational experience. Must attend and graduate from either EWTGPAC or EWTGLANT TACP School. When deployed on operations each USMC infantry company is allocated a FAC or JTAC. It is proposed that standard squad leaders will be trained as Joint Fires Observers. The Air Force trains JTACS at two locations, Nellis Air Force Base, Nevada and Spangdahlem Air Base, Germany. At Nellis the 6th Combat Training Squadron has two JTAC courses; Joint Terminal Attack Controller Qualification Course, Joint Terminal Attack Controller Instructor Course. The JTAC course at Spangdahlem is through the Joint Firepower Center of Excellence (JFCOE). Nellis is also home to the graduate-level JTAC Advanced Instructor Course through the U.S. Air Force Weapons School which is open to TACPs/ALOs and Combat Controllers/STOs. The course requires applicants to be qualified JTACs for three years and a JTAC Instructor for one year. The 5.5 month-long course is held twice per year and includes 752 total hours in classrooms and on ranges. The first class graduated in December 2012. They train in conjunction with pilots attending the Weapons School. As of June 24, 2015 29 airmen have graduated from the JTAC Advanced Instructor Course. Members of special operations units may attend the Special Operations Terminal Attack Control Course (SOTACC) at Yuma Proving Ground, Arizona. SOTACC was established 2003 under the Army's John F. Kennedy Special Warfare Center and was subsequently transferred to the Air Force Special Operations Command's Special Tactics Training Squadron in 2008. JDAT, formerly JFIIT, provided SMEs for the revision of the NATO Standardization Agreement (STANAG) 3733, the JFIRE Multi-Service Procedures for the Joint Application of Firepower publication, and Joint Terminal Attack Controller (JTAC) Memorandums of Agreement for DoD and partner nations. ^ "NATO STANAG 3797 MINIMUM QUALIFICATIONS FOR FORWARD AIR CONTROLLERS & LASER OPERATORS IN SUPPORT OF FORWARD AIR CONTROLLERS". NATO. Archived from the original on August 29, 2009. ^ "Training the RAF's eyes and ears". BBC. February 14, 2009. Retrieved May 7, 2010. I ask if Prince Harry's deployment as a forward air controller, or what the Americans term a "JTAC" (joint tactical air controller or joint terminal attack controller), has boosted the number of volunteers for the job. ^ Lieutenant Colonel Steven P. Milliron, Army Aviation. "Army JTAC training--the way ahead". U.S. Field Artillery Association. Effective 3 September 2003 with the publishing of Joint Publication (JP) 309.3 Tactics. Techniques and Procedures (TTP) for Close Air Support, the joint community codified the requirements for an individual to direct the actions of combat aircraft engaged in CAS and other air operations. This position, called a "joint terminal attack controller" was created to standardize the certification and qualification process for terminal attack controllers to ensure a common capability across the services. The Army needs to develop Soldiers who, from a forward position, can deliver joint indirect fires and direct the actions of joint combat aircraft. The Joint Combat Aircraft (JCA) is the official designation used by the United Kingdom's Ministry of Defence for the F-35 Lightning II, formerly known as the Joint Strike Fighter, and the result of the Joint Strike Fighter competition. ^ Allard, Tom (March 17, 2008). "New squadron will aim to cut civilian deaths". The Sydney Morning Herald. Retrieved September 19, 2008. ^ Air Power Development Centre (June 2014). "Combat Control in the RAAF". Pathfinder Issue 224. Royal Australian Air Force. ^ "16th Air Land Regiment, Royal Australian Artillery". Australian Army. Archived from the original on November 6, 2016. Retrieved November 6, 2016. ^ "Joint Terminal Attack Controller (JTAC) - Canadian Forces College" (PDF). ^ "Task Force 45". Colmoschin.it. Retrieved November 7, 2014. ^ "Home - 185 RRAO". 185 RRAO. Retrieved November 7, 2014. ^ "MC-27J Praetorian - Alenia Aermacchi". Aleniaaermacchi.it. Retrieved November 7, 2014. ^ "Full text of "Joint Fire Support Executive Steering Committee Governance and Management, 23 May 2014"". Archive.org. Retrieved July 18, 2016. ^ Maj Brian T Koch (February 2007). "Evolution of ANGLICO". Marine Corps Gazette. Archived from the original on January 12, 2016. ^ "United States Marine Corps (USMC) Officer Job Descriptions". Forward air controller/air officers direct and control close air support missions and advise commanders of ground units on matters pertaining to air support. ^ Rupert Pengelley (November 2008). "USMC proposes to train more squad leaders to act as FACs". International Defence Digest: 4. ^ "First enlisted airmen eligible to wear Weapons School patches". Airforcetimes.com. June 24, 2015. Retrieved July 18, 2016. ^ "Air Force becomes newest YPG tenant | Military News". Yumasun.com. July 8, 2009. Retrieved July 18, 2016. ^ "Joint FIRES Integration and Interoperability Team" (PDF). The Joint Staff. Retrieved March 9, 2016. Wikimedia Commons has media related to Joint terminal attack controllers. Well in control, Australian Army News, September 21, 2006.